Two free eye camps for the underprivileged people were held at New Castle International School premises in Jatrabari in the city and at Raipur Union Parishad Bhavan, Thakurgaon Sadaron Saturday. 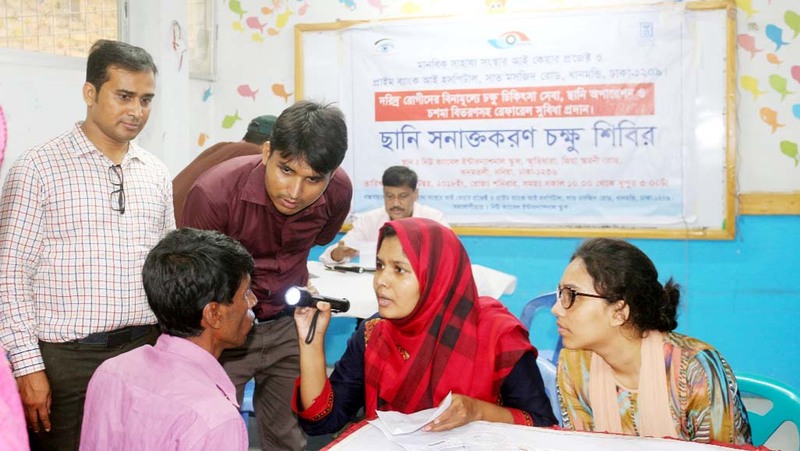 The eye camps were organized by the Eye Care Project of Manabik Shahajya Sangstha with the technical assistance of Prime Bank Eye Hospital, Dhaka and Safiuddin Ahmed Foundation Eye Hospital, Thakurgaon. The eye camps provided eye-screening services, distributed eyeglasses and identified cataract patients who will be operated shortly at our partner hospitals. All services at the camp were provided for free. A total of 1508 patients were screened, 422 free eyeglasses were provided and 149cataract patients were identified for surgery in these two eye camps. "ECP is committed to provide eye care services including eye screening, eye glasses and medicines, identify cataract patients and facilitate eye surgeries of the underserved people in remote areas " said MSS President Feroz M Hasan. ECP-MSS is working to eliminate curable blindness in Bangladesh. ECP beliefs that nobody should remain blind due to poverty.